West Bengal Chief Minister Mamata Banerjee and Odisha's Naveen Patnaik had allied with the Bharatiya Janata Party (BJP) in the initial years of their having broken away from national parties to launch regional political parties. Both now find that their one-time junior ally in the state, the BJP, has become an albatross around their necks. Banerjee-led Trinamool Congress and Patnaik-led Biju Janata Dal (BJD) have employed interestingly similar strategies to take on the BJP's challenge -- replacing their incumbent MPs, fielding more women and a mix of veterans and unsung social and political workers from marginalized sections of the society. West Bengal and Odisha are two states where the BJP hopes to improve upon its 2014 tally, and somewhat compensate the losses it could suffer in the Hindi heartland. Banerjee, who has ruled Bengal since 2011 and Patnaik has been Odisha's chief minister since 2000, face electoral battles of their lives. After breaking away from the Congress, Banerjee launched the Trinamool on January 1, 1998. Patnaik parted ways with the Janata Dal to found the BJD less than a week the founding of Banerjee-led Trinamool, on December 26, 1997. Banerjee's Trinamool allied with the BJP for 1999, 2004 Lok Sabha polls, and 2006 Assembly polls. Patnaik-led BJD had allied with the BJP until 2009. Patnaik and Banerjee were ministers in the Atal Bihari Vajpayee government. 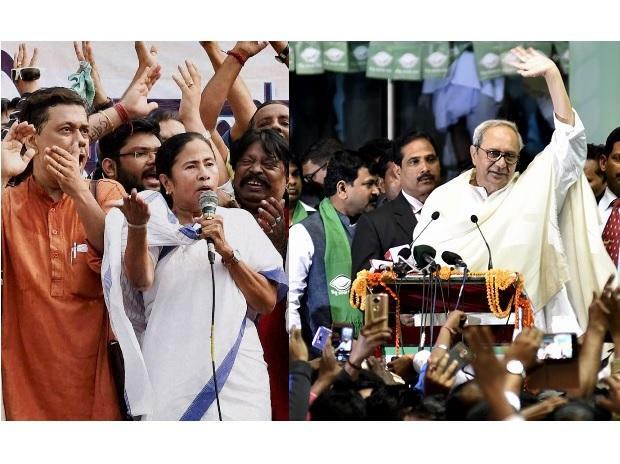 In both the states, the BJP has now emerged the principal challenger for Banerjee and Patnaik's parties and both would be struggling to have their parties repeat their success in the 2014 Lok Sabha polls. In 2014, Trinamool won 34 of Bengal's 42-seats, while BJD won 20 of Odisha's 21 seats. In Bengal, Trinamool has announced candidates for all 42-seats. It has fielded 17 women, or 41 per cent. Seven of its candidates are Muslims, while Dalits, political debutantes and actors are well represented. Odisha will have its Assembly polls along with the Lok Sabha polls. Patnaik unveiled his strategy to beat anti-incumbency in February. He asked Prime Minister Narendra Modi to pass the Bill that provides for 33 per cent reservation to women in Parliament and state legislatures. Subsequently, Patnaik announced plans to implement the 33 per cent rule in his party. Earlier this week, the BJD announced candidates for the seats going to polls in the first two phases on April 11 and 18. It announced 54 Assembly candidates. Odisha has 147-Assembly seats. Of the 54 candidates, 10 are women. The BJD also announced nine Lok Sabha candidates, a third or three of which are women. The BJD has named its campaign 'Mission Shakti to Sansad'. Patnaik tweeted on Tuesday, alluding to women self-help groups (SHGs) in the state that his government has promoted since 2000 and his party fielding a 68-year-old member of that group from the Aska Lok Sabha seat, that the mission "is now a silent revolution transforming lives of more than 7 million women". The BJD has fielded Pramila Bisoi from Aska. Patnaik had made his electoral debut from the seat in 1999. His father Biju Patnaik had earlier represented the seat. "The choice of Pramila Bisoi from Aska Lok Sabha seat, from where I started my political journey, is a fitting tribute to millions of 'Mission Shakti' women," Patnaik said. Bisoi heads an SHG in Nalabanta village of Aska. She was selected over several other women, including those from erstwhile royal families of the state. One of Bisoi's two sons runs a tea stall in the family's native village, while the other is a garage mechanic. Her two daughters are married and her husband owns less than an acre of farm land. Ladu Kishore Swain, the sitting MP from Aska, passed away in February, and BJD has nominated his wife, Manjula Swain, from the Aska Assembly seat. The BJD has replaced candidates in Kalahandi, Nabarangpur, Berhampur, Bargarh and Kandhamal. In Koraput, it has given the party ticket to Kausalya Hikaka, wife of the sitting MP. It is fielding some of its better performing ministers in the state government, including Ramesh Chandra Majhi. Banerjee's Trinamool replaced candidates for 18 Lok Sabha seats, and 17 are new faces. The Trinamool had nominated 35 per cent women candidates in 2014, which has increased to 41 per cent. Newcomers include actor Mimi Chakraborty, the candidate from the Jadavpur seat, Nushrat Khan from Basirhat and Rupali Biswas, whose husband and Trinamool legislator Satyajit Biswas was killed recently in Nadia district. She will contest from the Ranaghat seat. She would turn 25 days before nomination and would be eligible to contest the polls. The Trinamool is also fielding some of its veteran ministers, particularly Subrata Mukherjee.